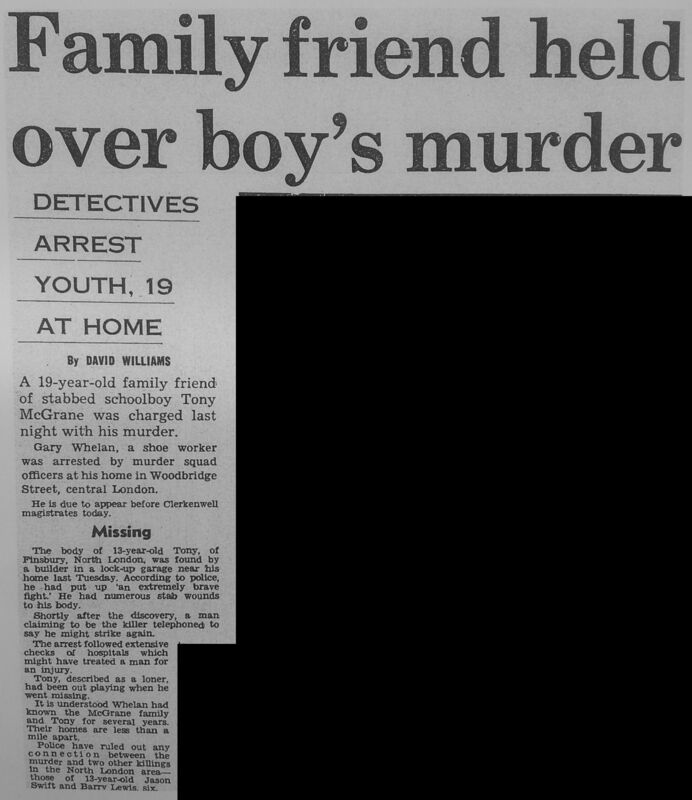 13 year old Tony McGrane was murdered near his home in Kings Cross in 1986. 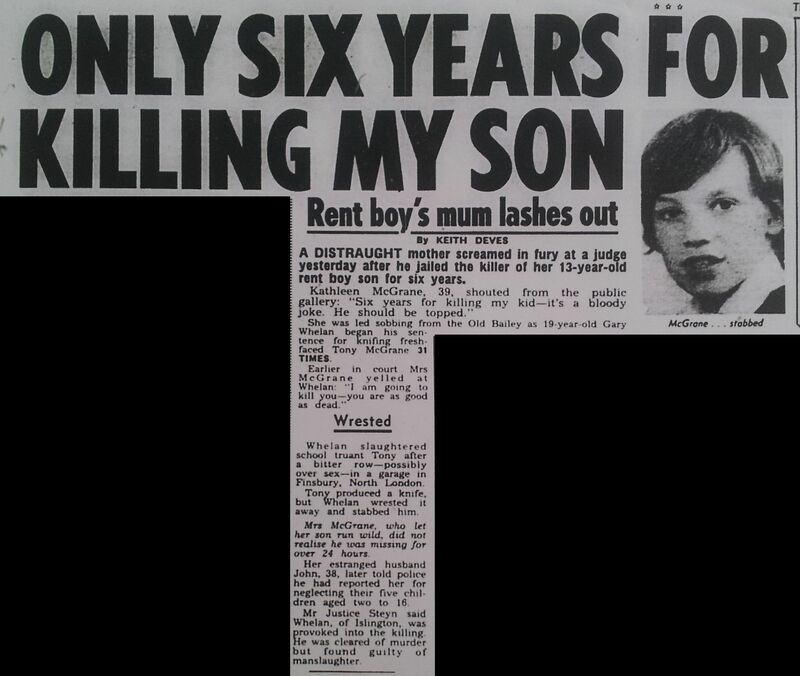 Islington Council wasn’t mentioned in any of the press coverage, but the Daily Mail reported that he was ” a regular truant from Conewood Assessment Centre School”. There was no such school, but there was a children’s home called Conewood Street Assessment Centre in Highbury which was run by Islington Council. 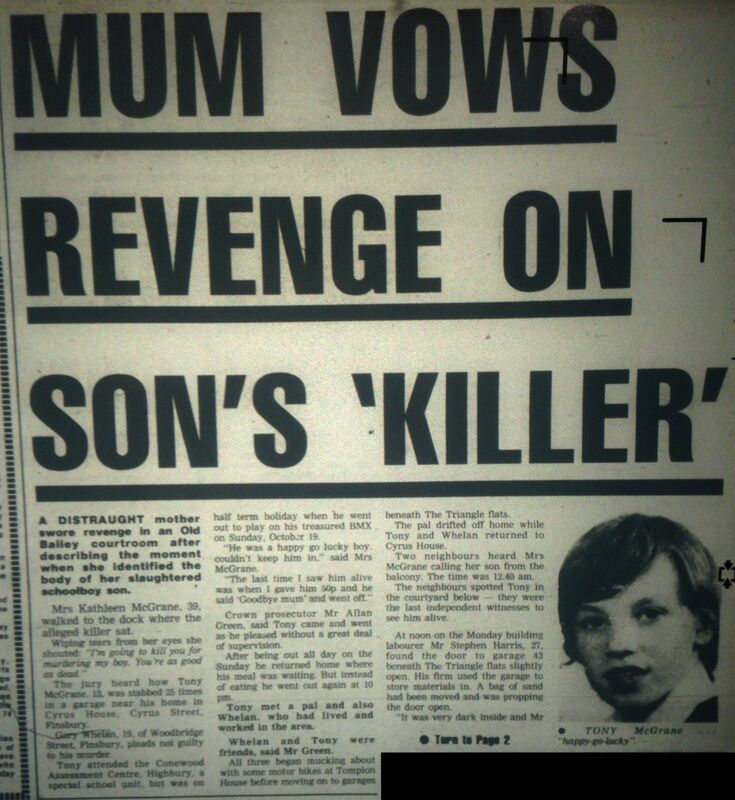 14 year old Jason Swift, who was raped and killed in 1985 by Sidney Cooke, Leslie Bailey, Lennie Smith, Robert Oliver, Stephen Barrell, and a number of unidentified men, is also thought to have attended Conewood Street Assessment Centre in the months before his death, although this wasn’t mentioned in any of the press coverage, and any files that Islington Council held on Jason have almost certainly been destroyed, along with many other files on children in their care. 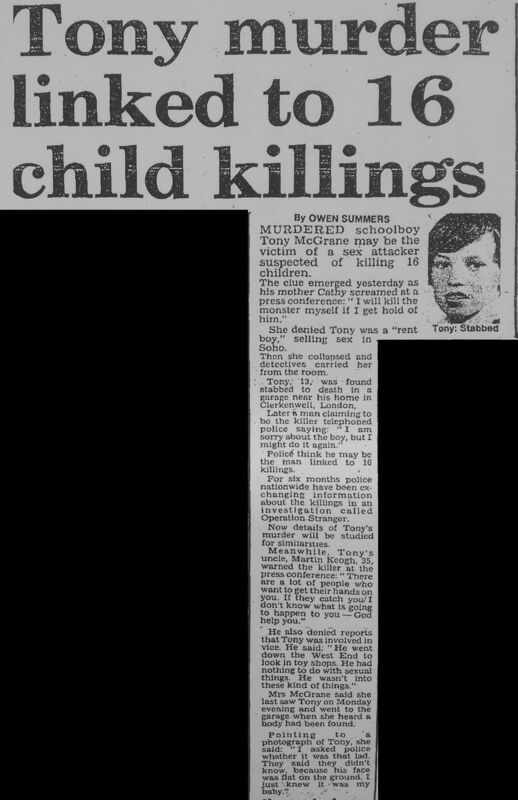 All these horrific crimes against children in the care of Islington Council were committed while Margaret Hodge was council leader (1982-1992). 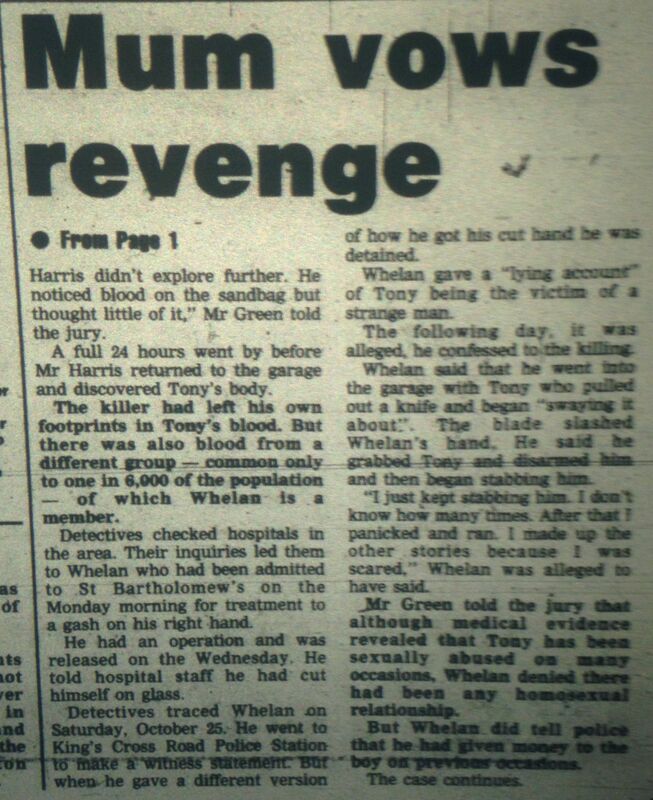 When a shocking catalogue of abuse was exposed by the Evening Standard in 1992, Hodge accused the paper of “sensationalist gutter journalism”. Tony Blair later appointed her as the first Minister for Children. 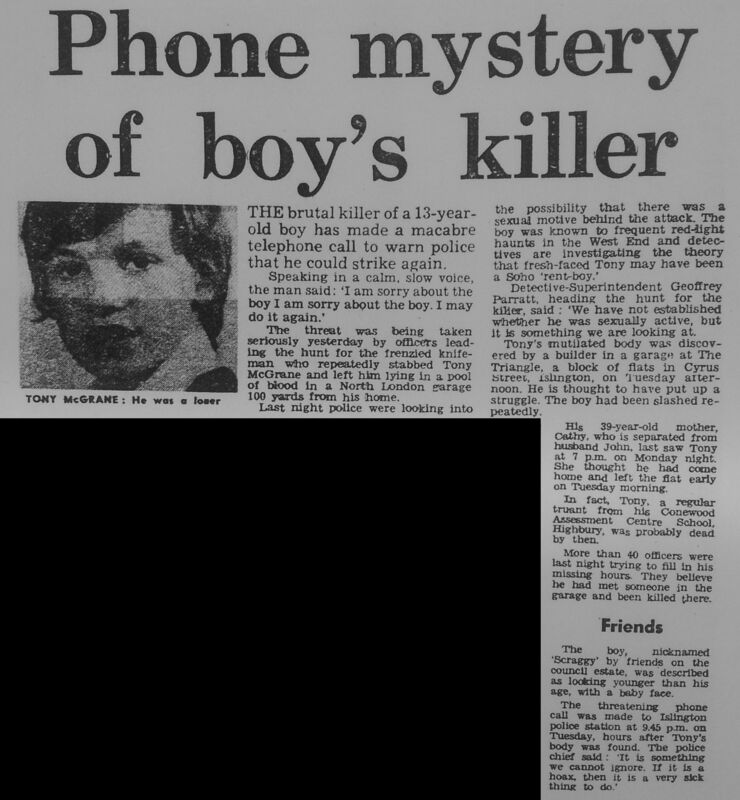 A mystery caller was being hunted last night by police investigating the murder of a schoolboy. 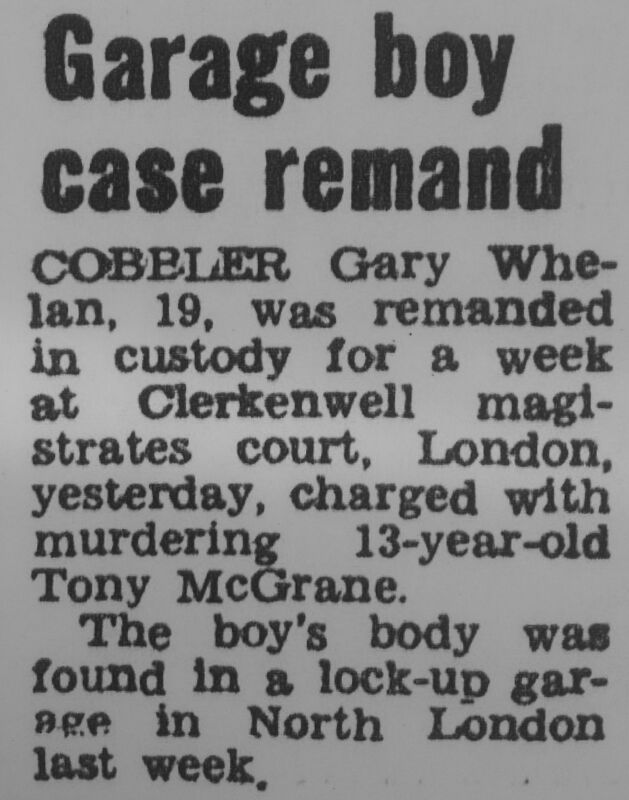 Tony McGrane, aged 13, of Cyrus Street, Clerkenwell, London, was found with stab wounds in a garage opposite his home on Tuesday. A detective at an incident room at King’s Cross Police Station was called by a man who said: ‘I am sorry about the boy, but I may do it again. ‘ The call is being treated seriously. A man was remanded in custody yesterday accused of the murder of Tony McGrane, aged 13, whose body was found with stab wounds in a garage near his home in Clerkenwell. Gary Whelan, aged 19, a factory worker, of Islington, North London, made no application for bail at Clerkenwell magistrates. Rest in Peace, Tony. Just an innocent child, failed by ‘adults’. May your murderer never rest peacefully.